I'm starting a new feature. No reason, other than that the fancy takes me and the idea struck me when I was travelling back on the East Coast Mainline from Edinburgh last week. The idea is that I'm periodically going to revisit a formative album from my past. I'll look at what it means to me and will then give it a critical reappraisal by giving it a damn good listening to and writing up what I find. I don't know if I'll do it very often - perhaps I'll end up doing it every week - but I thought it might be fun to track back through the years and see how I ended up where I am musically today. "We're Looking for the Whales"
"The Weight of the Wind"
The album was a worldwide success, going platinum in the UK and reaching number 2 in the album chart. So much for the bare facts. What does the album mean to me? Well I was given the album on cassette for my birthday in March 1987. This wasn't the first album I ever owned - that honour belongs to "Kings of the Wild Frontier" by Adam and the Ants. It wasn't even the second or third, as I went through something of a Nik Kershaw phase in the couple of years before this that saw me getting both "Human Racing" and the "Riddle". At around this time though, I was avidly taping songs off the chart show every Sunday night and was just starting to become seriously interested in music to the extent that I asked for a few albums on my birthday list. I remember asking for "Running in the Family" by Level 42, which wikipedia tells me was released in the same month as my birthday (I was thirteen). 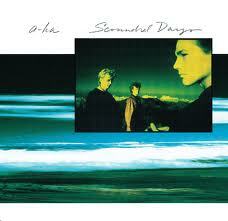 I didn't get that, but I did receive a copy of "Silk and Steel" by Five Star and this album by a-ha. Why a-ha? (actually, why Five Star is probably the better question, but that's for another day). Well, like everyone else, I remember being bowled over by "Take on Me" in particular and they were, of course, one of the biggest bands of the day. I don't remember any of the singles from this album, although both "I've Been Losing You" and "Cry Wolf" were released late in 1986, and "Manhattan Skyline" was released in February 1987, so it's entirely likely that I taped them off the radio and took a shine to them enough to ask for the album. Funnily enough, I don't remember listening to the album all that much. On cassette the album was oddly formatted so that one side had an awful lot of blank space on it. I had a fast forward button on my crappy one-speakered cassette player, of course, but I remember finding that really annoying. Other than that, I don't really remember spending an enormous amount of time listening to the album. I think I did listen to it lots, but I don't remember it. Regardless, it's still a pivotal album for me: Nik Kershaw had been a shared experience with my best friend that he had discovered first and shared with me, but a-ha was all me and for that reason it's one of the first places where my love of music - and the buying of music - really started. I think the reason that I don't remember the album all that much is that I changed schools in September 1987, and by Christmas that same year, I had bought my first Iron Maiden album and was well on my way into heavy metal. My path took a very different turn for a while, and it wasn't until much later that I found my way back to a-ha and began to appreciate them all over again. I actually saw a-ha live a couple of times fairly recently, in 2009 and 2010, and they were splendid both times. After the first of those gigs, I was given a copy of this album on CD for Christmas by a very thoughtful friend who knew its significance to me, and at the gig in 2010 they actually played most of that album in full to celebrate the twenty-fifth anniversary of the original release. It sounded splendid, but in many ways I had been on such a journey of my own since 1987 that it was really like discovering those songs all over again. So what does it sound like today, in 2013? Well, I suppose this is cheating since I actually rediscovered the album a few years ago, but they sound pretty good actually. Sure, there are large parts of this that sound inescapably like the 1980s, with those synths and drums. That much was probably inevitable. There are very few points on this album where that production is allowed to overwhelm the songs themselves. Morten Harkett, of course, has an absolutely magnificent, pure voice, and that cuts through almost everything else. There's also a kind of epic Scandinavian aloofness to this record, an iciness that gives the whole thing an air of timelessness. It helps that the songs are pretty bloody good too: just have a listen to "Scoundrel Days", "The Swing of Things", "I've Been Losing You" or - especially - "Manhattan Skyline" and discover again what bloody good songs they are. Listen to his voice! Amazing. It's a bit 80s in places, perhaps, but the quality of the song easily cuts through that. Great lyrics too. It's not all good, and I could happily do without "October" (which - weirdly - reminds me a bit of Scott Walker, "Time Operator" perhaps), and "Maybe Maybe" perhaps lacks a little gravitas, but it's still an album I can happily listen to... and in fact, it's been a real pleasure putting it back on again this week. They were a properly good band, you know and their music I think has stood the test of time and would probably have been as successful in any era (with the appropriate contemporary production, perhaps). A great place to start. I may have had to go all the way through a lot of shouty heavy metal to get to this point, but I swear that this album sounds better to me now than when I first heard it in 1987. Where to next, I wonder? Thirteen seems a little old to be seriously starting to buy music, but I think that's probably more to do with money and attending a boarding school more than anything else (I.e. lack of opportunity). I used to read smash hits and watch top of thepops every week so I must have been interested to some extent. As I linked to that Scott Walker song above, I noticed how suddenly he's ALL OVER YouTube, when only a couple of years ago there was literally only a couple of homemade cover-versions there (including an excellent version of "the bridge" by a guy from Nottingham). Suddenly, it's all there, including clips from his tv show. Hmm. I might have to do Walker in this series at some point.